What each of us does with that hour is a personal decision, but it is a great time for families to get together and have some fun, with at least a passing discussion of the environmental issues that concern us. People in more than 180 countries are participating this year in Earth Hour, according to the website of the World Wide Fund for Nature (formerly World Wildlife Fund), which started the event in 2007. “Earth Hour 2019 is a powerful opportunity to start an unstoppable movement … to help secure an international commitment to stop and reverse the loss of nature,” Marco Lambertini, director general of WWF International, said in a news release. For many, turning off the lights is a symbolic commitment, a first step on the road to mass change. People in some countries have gotten together to set specific goals. People in Ecuador, for example, are pushing for a legal ban on certain plastics; Finland is encouraging a move toward healthier, sustainable foods; Morocco is educating people about saving water; and Indonesia is encouraging its youth to adopt greener lifestyles, according to organizers. As I post this, Earth Hour is underway in India and already over in Australia and most of Asia. Why are the lights out? Should we turn off the lights every night then? 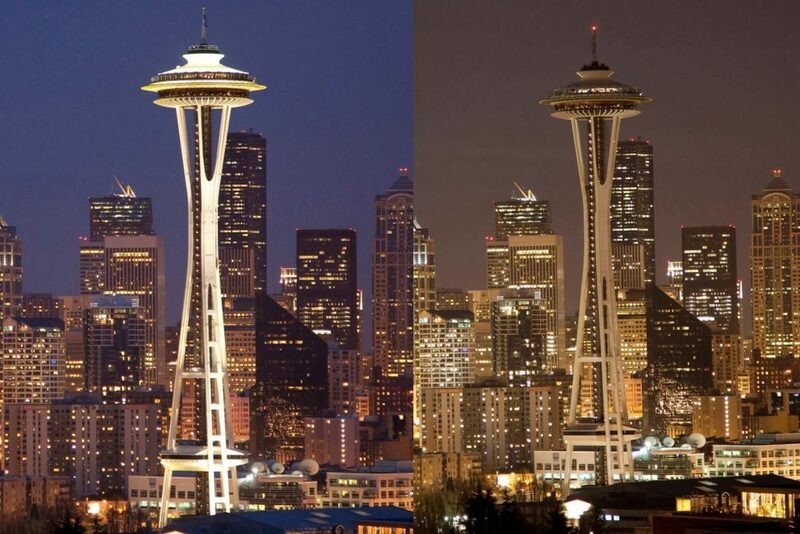 The Space Needle is one of Seattle’s landmarks scheduled to go dark tonight. Since the beginning, Earth Hour has been celebrated by those who control some of the world’s most-famous landmarks, from the Space Needle in Seattle to the Empire State Building in New York, Tower Bridge in London and Taj Mahal in Agra, India. Other landmarks in Seattle that have gone dark in the past (I’m not sure about this year) include Key Arena, the Museum of Pop Culture (formerly Experience Music Project), Pacific Science Center, Showbox at the Market (downtown Seattle), Showbox SoDo. 1201 Third Avenue (formerly Washington Mutual tower) and University of Washington Tower, according to a story by KIRO-TV news. Earth Hour is a partnership between WWF and the United Nations Convention on Biological Diversity. Check out the Connect2Earth platform.